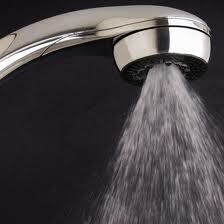 A landlord can pass water charges onto their tenants provided the premises are water efficient. A property being water efficient is not required by law but until such devices are installed a Landlord cannot charge for water. The landlord is responsible for the cost of making the premises water efficient and this applies to toilets, shower heads and to internal cold water taps for the bathroom hand basin and for the kitchen sink. The requirements do not apply to other taps such as bathtub taps, laundry taps, outside taps for the garden, or taps for washing machines and dishwashers. Internal cold water taps, kitchen sink taps, bathroom hand basin taps and showerheads must have a maximum flow of 9 litres per minute. Toilets must have a dual flush function installed not exceeding 6.5 litres on full flush and 3.5 litres on half flush with a maximum average flush volume of 4 litres (based on the average of one full flush and four half flushes). Landlords are responsible for ensuring there are no leaking taps anywhere on the premise at the start of a tenancy or when the water efficiency measures are installed. A Landlord can install water efficiency measures themselves or use a licensed plumber. There are many different types of flow restrictors you can install on your shower heads so the quality of the water flow is not reduced. It’s not necessary to provide a report from a plumber or have a water supply authority certifying the property is water efficient however it is a good idea to keep records, copies of invoices or notes of work done, receipts, packaging, warranties or manuals. Also be sure to note the presence of the water efficiency measure on the incoming entry condition report for the premise. If a tenant offers to pay for water charges, preferring not to have the water efficient devices installed, under the tenancy laws a Landlord cannot pass on water charges to their tenant unless the property has the required water efficiency measures in place. Some local councils and water authorities offer rebates or other assistance to people who install devices which save on water and energy consumption and assist the environment. And some local council’s run free shower head exchange days and distribute DIY water saving kits which include flow regulators and tap aerators. Contact your local council or water authority to inquire about assistance available in your area. Whether you’re a tenant or Landlord, saving water and costs is a good idea!